What is the HiNTs Exam? 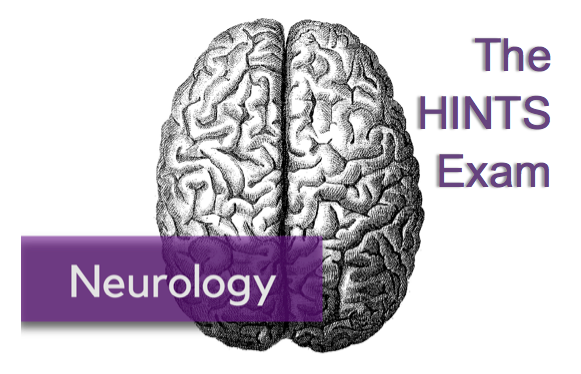 The HiNTs Exam is a screening tool for distinguishing a central cause of vertigo from an acute peripheral vestibulopathy (APV), such as benign paroxysmal positional vertigo or vestibular neuritis. The reason for stratifying is obvious (early intervention for central processes, prevention of adverse outcomes), but the degree of difficulty in correctly stratifying a patient is not. A normal neurological exam cannot accurately exclude a central process; 10% of patients with a cerebellar infarct, usually in the medial branch of the PICA, will have isolated vertigo without other associated deficit. In the HiNTs exam derivation paper, only 51% of those with a central process causing vertigo had a neurological sign on exam. While risk factors, including age, can be helpful in risk stratification, there is again no definitive cutoff that can eliminate the risk of a central process. Notably, it can only be used if the patient is currently symptomatic, and is meant for continuous, not intermittent, symptoms. How to correctly perform the head impulse test with demonstrations of a negative (A) and positive (B) finding . The horizontal head impulse test is consistent with peripheral vertigo if it is positive in one direction only. If there is a lag in corrective saccades in both directions, it may be concerning for central vertigo. This test can also be performed in the vertical plane. A lag in corrective saccades in the vertical plane is always suspicious for a central etiology for vertigo. Pitfalls: The patient must be awake and cooperative. This is essentially an awake “doll’s eye” that requires conscious fixation on an object. Patients who are mentally impaired, unable to fixate, or sedated cannot do this maneuver. Likewise, anxious patients who are unable to relax their neck are unable to do this procedure adequately. False negatives often result from an inexperienced practitioner being too gentle with the head thrust due to fear of causing neck injury. Contraindications: Any patient that has head trauma, neck trauma, an unstable spine, or neck pain concerning for arterial dissection. This maneuver may extend the injury. In addition, one should avoid this in patients with known severe carotid stenosis as it may embolize unstable plaque. An acceptable alternative is assessing for ocular dysmetria. Note if it is present in primary gaze (i.e. looking straight ahead) and or in lateral gaze. What direction is the fast component? If the nystagmus is worse looking in one direction, with the fast component present in that same direction on contralateral gaze, it is unidirectional and reassuring for peripheral vertigo. If, for example, a patient has right-beating (fast direction to the right) nystagmus with rightward gaze and leftward gaze, this is unidirectional right-beating nystagmus. The most common peripheral nystagmus, BPPV, in the posterior semicircular canal consists of a unidirectional horizontal nystagmus with a torsional component. Bidirectional nystagmus, I.E fast component to the right with rightward gaze and to the left with leftward gaze, is concerning for a central process, as is vertical nystagmus or pure torsional nystagmus. Again have the patient maintain his/her gaze on your nose. Alternate covering each of the patient’s eyes. A positive result will be the deviation of one eye while it is being covered, followed by correction after uncovering it. In the derivation study, it was performed by one practitioner who was a neuro-ophthalmologist using specialized equipment to measure skew. The study has not yet been validated by a large external group, let alone a large external group of emergency medicine providers. We do not know the sensitivity of the test in this population. As such, while useful in stratifying patients and documenting low risk patients, it would be prudent to err on the side of caution with moderate risk patients given the limited evidence of the sensitivity and specificity of the HiNTs exam in the hands of emergency medicine providers. Should l get imaging, and if so, what? As such, there are three possible pathways for these patients: no imaging in the lowest risk, CT vs CTA for patients with concern for bleed or dissection, or MRI +/- CT for ischemic stroke rule out. Here is an example of one way to document the HiNTs exam. As a default, a negative exam is used. Please feel free to use and adapt it. [Peer-Reviewed, Web Publication] LaPlant W, Parmar M (2018, Jan 15). Vertigo: A hint on the HiNTS exam. [NUEM Blog. Expert Review By Chang P]. Retrieved from http://www.nuemblog.com/blog/hints. 1. Nelson J a, Viirre E. The clinical differentiation of cerebellar infarction from common vertigo syndromes. West J Emerg Med. 2009;10(4):273-277. 2. Kattah JC, Talkad A V., Wang DZ, Hsieh YH, Newman-Toker DE. HINTS to diagnose stroke in the acute vestibular syndrome: Three-step bedside oculomotor examination more sensitive than early MRI diffusion-weighted imaging. Stroke. 2009;40(11):3504-3510. doi:10.1161/STROKEAHA.109.551234. Posted on January 15, 2018 by NUEM Blog and filed under Neurology and tagged vertigo hints exam central vertigo peripheral vertigo bppv nystagmus skew deviation head impulse.